Mariánské Lázně ( [ˈmarɪjaːnskɛː ˈlaːzɲɛ]; German: Marienbad) is a spa town in the Karlovy Vary Region of the Czech Republic. The town, surrounded by green mountains, is a mosaic of parks and noble houses. Most of its buildings come from the town's Golden Era in the second half of the 19th century, when many celebrities and top European rulers came to enjoy the curative carbon dioxide springs. German settlers were called into this region by Bohemian rulers from the Přemyslid dynasty in the 12th Century. Although the town itself is only about two hundred years old, the locality has been inhabited much longer. The first written record dates back to 1273, when there was a village of Úšovice. The springs first appear in a document dating from 1341 where they are called "the Auschowitzer springs" belonging to the Tepl Abbey. It was only through the efforts of Dr Josef Nehr, the abbey's physician, who from 1779 until his death in 1820 worked hard to demonstrate the curative properties of the springs, that the waters began to be used for medicinal purposes. The place obtained its current name of Marienbad in 1808; became a watering-place in 1818, and received its charter as a town in 1868. By the early 20th century, approximately 1,000,000 bottles of mineral water were exported annually from Marienbad. The water from the Cross Spring (Kreuzquelle, Křížový pramen) was evaporated and the final product was sold as a laxative under the name of sal teplensis. The modern spa town was founded by the Tepl abbots, namely Karl Kaspar Reitenberger, who also bought some of the surrounding forests to protect them. Under the guidance of gardener Václav Skalník, architect Jiří Fischer, and builder Anton Turner the inhospitable marshland valley was changed into a park-like countryside with colonnades, neoclassical buildings and pavilions around the springs. The name Marienbad first appeared in 1786; since 1865 it has been a town. Then a second period of growth, the town's Golden Era, came. Between 1870 and 1914 many new hotels, colonnades and other buildings, designed by Friedrich Zickler, Josef Schaffer, and Arnold Heymann, were constructed or rebuilt from older houses. In 1872 the town got a railway connection with the town of Eger (Cheb) and thus with the whole Austro-Hungarian Empire and the rest of Europe. The town soon became one of the top European spas, popular with notable figures and rulers who often returned there. Among them were such names as Johann Wolfgang Goethe, Frédéric Chopin, Thomas Edison, Richard Wagner or Prince Friedrich of Saxony, King Edward VII of the United Kingdom, the Russian Czar Nicholas II, and Emperor Franz Joseph I and many others. At those times, about 20,000 visitors came every year. Marienbad remained a popular destination between World War I and World War II. After World War II, the ethnic German population of the town was forcibly expelled according to the Potsdam agreement, thereby emptying the town of the majority of its population. After the communist coup-d'état in 1948; it got sealed off from most of its foreign visitors. After the return of democracy in 1989 much effort was put into restoring the town into its original character. 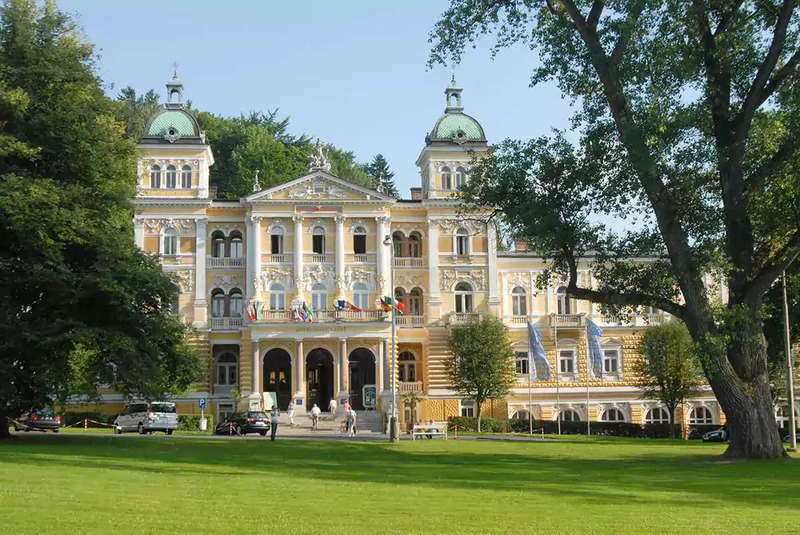 Today it is not only a spa town but also a popular holiday resort thanks to its location among the green mountains of the Slavkovský les and the Český les, sport facilities (the town's first golf course was opened in 1905 by the British King Edward VII) and the proximity to other famous spa towns, such as Carlsbad (Karlovy Vary) or Franzensbad (Františkovy Lázně). Until their expulsion in 1945 the majority of the population of the city spoke German (see Sudetenland). Nowadays, however, most of the inhabitants are Czechs. Křížový pramen (Cross Spring) - is the most famous spring of Mariánské lázně. A monumental pavilion with a cupola bearing a patriarchal cross and 72 Ionic columns was built over the spring in 1818-1826. Today's concrete building is a copy from 1911–1912, originally it was a light wooden and brick construction. The water from the spring is high-mineralized with a strong laxative effect, it has been used for both curative drinks and baths. Rudolfův pramen (Rudolph's Spring) - with a wooden pavilion built over the spring, some water is tapped and piped to the nearby colonnade and some is bottled. Its water is low-mineralized with high calcium content and has been used to cure urinary problems. Karolinin pramen (Caroline's Spring) - named after the wife of the Emperor Francis I, Caroline Augusta. The nearby colonnade was built in 1869, the pavilion is a reconstruction from 1989. The water is low-mineralized, with higher magnesium content. Ferdinandův pramen (Ferdinand's Spring) - the water from the spring, similar in composition to Křížový pramen, is bottled under the Excelsior label. Because of the diverse number of visitors the town is able to maintain churches of several denominations. These include the Anglican Church designed by the notable Victorian architect William Burges and founded by Lady Anna Scott in memory of her husband who died in Mariánské Lázně in 1867. The church was constructed in 1879, shortly before Burges's own death. It is no longer in use as a place of worship and is now a concert hall. The town's public transport is operated mainly by trolleybuses and accompanied by buses servicing the neighbouring villages. There are currently 4 trolleybus lines and 4 bus lines in operation (2016). The trolleybus system in Mariánské Lázně has been disputed several times since late 1990s by the town's council, claiming high network maintenance costs. Although this is true the current town's representation is looking for ways to keep the system running and asking for state and EU funds to preserve the system. The fact trolleybuses are emission-less makes them more suitable for a spa town than regular polluting buses - or even battery powered buses which are inadequate for a small system with minimal backups due to their low reliability. In addition Mariánské Lázně is one of the smallest towns in the world to operate a trolleybus system and may be viewed as one of the local tourist attractions, rising the value of the town.